The amazing ability of Calderdale people to recover from setbacks was the focus of the Council’s latest Vision2024 themed week on social media. 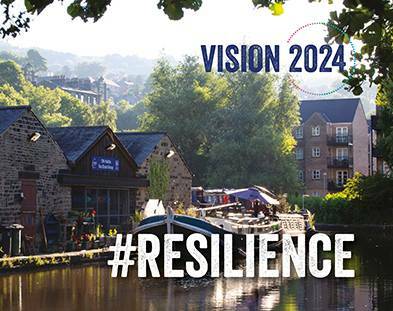 Thousands of people from across the borough got involved in #Resilience Week from 1 to 7 October 2018, which the Council ran to build awareness of the joint Vision2024 for Calderdale. In the year 2024 Calderdale will celebrate its 50th birthday. The Council is encouraging people and organisations to think about what makes Calderdale special and their ambitions for the area. Resilience is one of the themes of the Vision, along with distinctiveness, kindness, enterprise and talent. Each theme will have its own social media ‘takeover’ week, with kindness up next in the coming months. Individuals and organisations are invited to support the content, comment and share their own messages and photos covering the themes. Resilience Week was an even bigger success than the first of the takeovers, Distinctiveness Week, with much higher engagement. The Twitter and Facebook posts about resilience had a massive reach of nearly 207,000 people and there were almost 5,800 likes, shares, retweets and other engagements. Keep an eye out for the next themed week, and in the meantime, keep sharing content on your ambitions for Calderdale, and anything you’re doing that’s ambitious and future-facing. This entry was posted in Resilience, Vision2024. Bookmark the permalink.